Stunning handmade fusion glass wall clock. 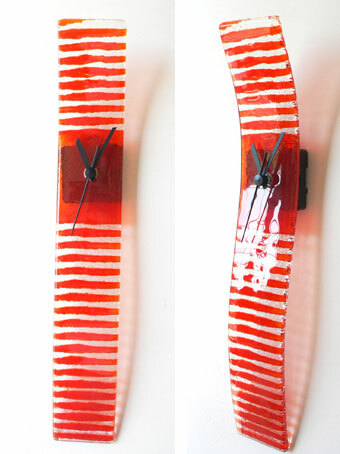 Set in clear glass design within which are horizontal fusion stripes of jazzy orange glass all the way down the clock. The clock is made in an eye catching and very contemporary slim curving design - great on any wall in any room in any home/office! Width is 6cm and length is a nice 41cm. This clock is handmade and to a high design quality, sure to draw comments from everyone who sees it!